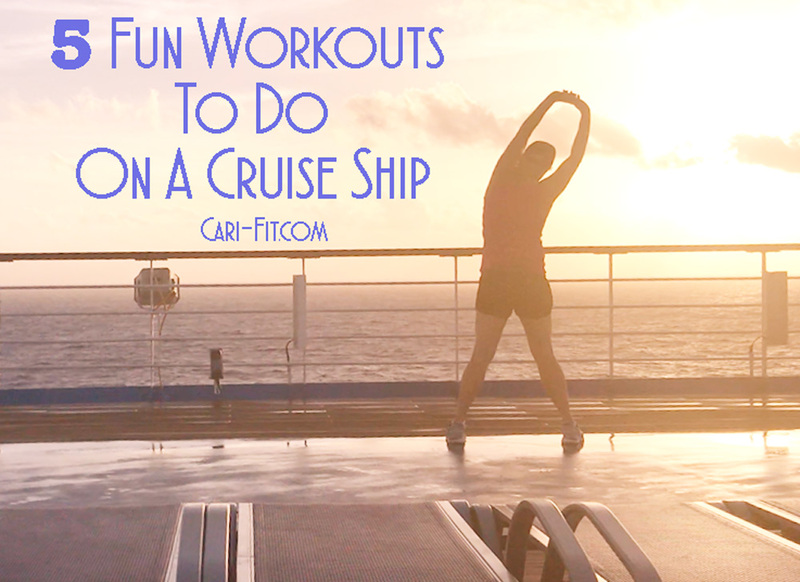 One of the things I love most about cruising is being able to mix up my workouts and take advantage of all the fun workout environments on board the ship. 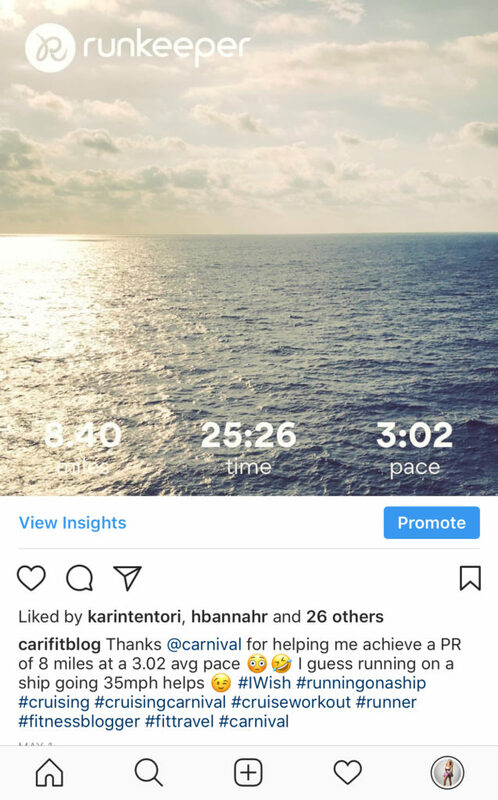 On my last Carnival cruise a few weeks ago – I decided to do some of my workouts outside because I wanted to enjoy the view. I feel like I get a new perspective on my workouts and feel so much more alive just by having a completely different workout environment. It’s so amazing being able to workout in the middle of the ocean! I recommend trying the ship’s gym as well – because most are very well equipped and even have great classes. 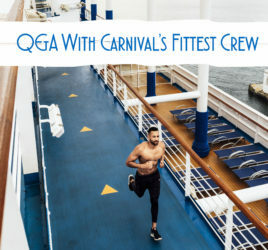 But, if you want to mix things up, try these 5 fun ideas for workouts to do on your next cruise that are not in the gym. *Please be careful when exercising outdoors on a cruise ship. Ships are often rocky, windy and unstable due to the weather conditions. Always be mindful and hold on to railings where applicable, or head indoors if it’s safer. This was my favorite. I took advantage of the ship’s outdoor track (almost all of them have an outdoor track) and decided to mix in some strength training. I started my Runkeeper app during my first run and soon found out that the gps was too accurate. It was factoring in the speed of my ship with my run and said I ran 8 miles in 25 minutes at a 3:03 min mile pace! If you aren’t familiar with running….let’s just say that would make me a world record holder and gold medalist! haha! I like to find a spot that’s a little more hidden. On Carnival they have the “Serenity Deck” and also areas outside on level 12 that sometimes are a little more private. If it’s too windy – you can just do a standing vinyasa flow, or if you are on a lower deck or less windy place you can grab your pool towel and even do a series on the “mat” (towel). Keep in mind – yoga you will do on the ship will be quite challenging since the ship is moving! This will make it harder to balance – but that makes it great for your core! Here is a Simple Yoga Workout you can do, or if you prefer something more challenging try This Hip Opener Sequence. I did have a balcony room, but if you don’t you can do this same circuit out by the pool or on one of the upper decks. This was a workout I did sometimes while my kids were napping and it worked out great. I packed an extra resistance band to use to mix in some extras like bicep curls (you can borrow one from the ship’s gym) and then I used a towel to do core on the ground. Most of the pools on cruise ships aren’t very big – but that doesn’t mean you can’t get in a workout. During peak hours they are probably going to be too crowded to get in some laps – so I recommend going during an off-peak time like when they first open in the morning. Your “laps” will be very short – but you can still swim laps on one side of the pool away from the other swimmers, or just dodge your way around your family and kids and make it a fun game! Swim laps or tread water for about 2 minutes. Inner/Outer Thighs. 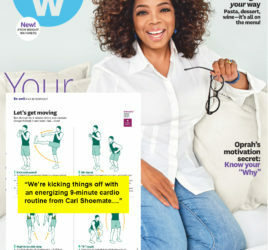 Hold on to the side of the pool and do 25 standing hip abductions (push leg out to the side) and then 25 hip adductions (bring leg across your body to work inner thigh). 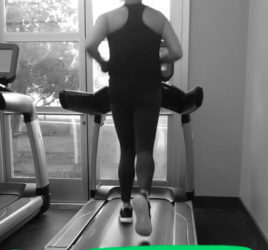 Keep your legs pretty straight. Repeat on both legs. Swim laps for 2 minutes. Ab crunches. Tread water and do standing abdominal crunches (if you have to hold on to the side you can). Bring your knees up to your chest and do a mini “crunch” with your core, then straighten legs back out. Repeat 10 times. Shoulder Raises. Stand or tread water and keep your hands by your sides (by legs). Make sure your shoulders are under the water and keep your palms your legs. Keep arms straight and raise them up so they come up to the top of the water, then press them back down to your legs. Repeat 20 times. 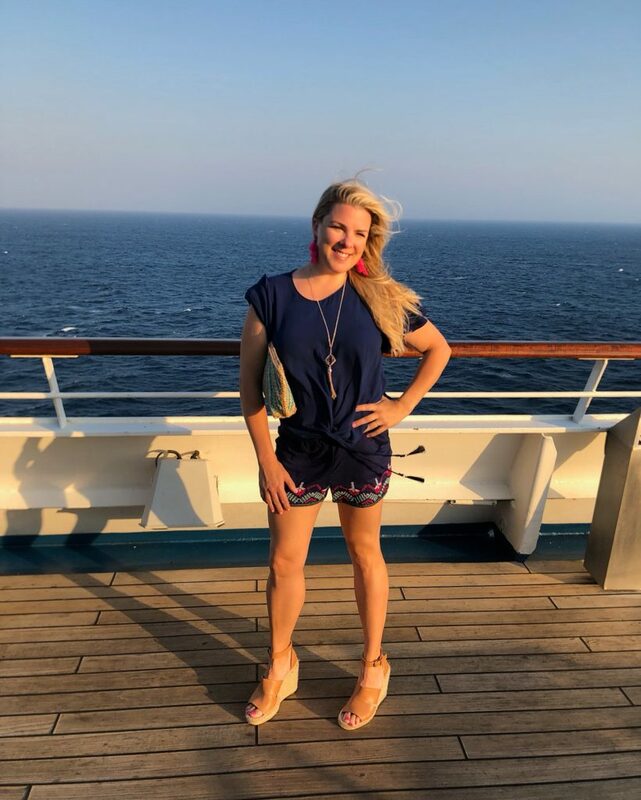 Comment below and let me know what your favorite travel workouts or cruise ship workouts are! *All opinions in this blog post are my own.